LAS VEGAS - Last Monday, veteran ethicisist Robert Rose and I filed a Request for Opinion with the Nevada Commission on Ethics asking whether LV Mayor Oscar Goodman violated state law by repeatedly failing to disclose at public hearings that he once collected extensive legal fees from Billy Walters, then granted the golf course developer valuable favors. This was not the first time Goodman has been the recipient of criticism for lapses in ethical judgement. He was found guilty in May 2004 of violating the state ethics law based on another complaint filed by Robert Rose. On Tuesday, September 27, 2005, the Las Vegas Sun published a story (attached): entitled: “Miller, Rose file ethics complaint against Goodman." 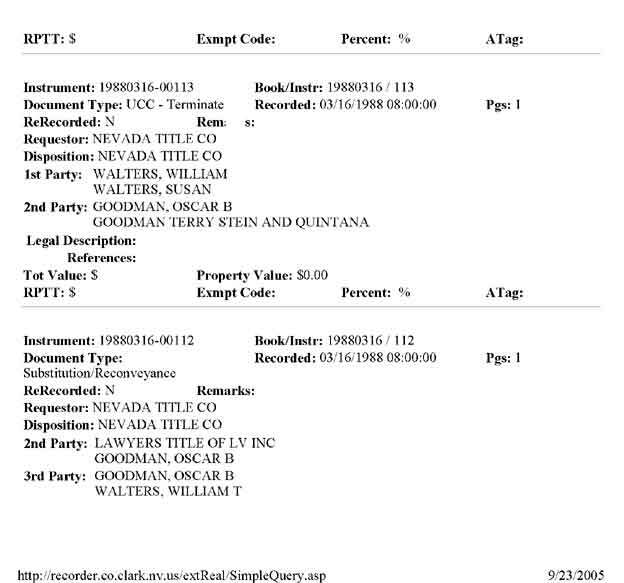 Based on this information, it is clear that the fee Mr. Walters paid Mr. Goodman was very significant, since the house Mr. Walters refers to was located on the Las Vegas Country Club, where in the 1980s, homes sold for a minimum of one-half million dollars and up. Mr. Walters’ own words in this LV Sun article indicate that a sizable amount of money changed hands between then-attorney Goodman and Mr. Walters during years prior to Mr. Goodman’s election as Mayor of Las Vegas. Then, on Wednesday, September 28, 2005, the Las Vegas Review-Journal published an article (attached) entitled: “Ethics complaint filed against Goodman." In this article, reporter Ed Vogel states that Goodman said, "That relationship terminated, oh I'd say several years ago." If a business relationship worth hundreds of thousands of dollars terminated “several years” prior to Mayor Goodman participating in votes to enrichen his former client, this information needed to be publicly disclosed during every hearing wherein Mr. Walters appeared before his former criminal defense attorney to ask for favors. This did not happen, and therefore we request the official opinion of the Nevada Commission on Ethics regarding Mayor Goodman’s blatant failure to disclose his previous, lucrative relationship with Mr. Walters. Walters, in the 1980s, was three times indicted on money laundering charges. However, Oscar Goodman, his first criminal defense lawyer, got him off as he had other clients including the late Tony "the ant" Spilotro. In recent years, Billy Walters has transformed into a pillar of the community and often appears before the city council and county commission asking for favors to enhance his business interests. In June, he even got the state government to give his golf courses a sizable tax break! He usually gets what he wants with little discussion from elected officials, or attention from the media -- until now. Keep in mind that Walters is heavily involved in fund raising for many suspect local and state politicians. Billy is best known for putting together lavish campaign parties for select political candidate's at his ultra trendy Cili restaurant at his South Strip Bali Hai Country Club. I was the first to report that Walters in 1999 purchased 160 acres of publicly owned land just off the Boulder Strip (location of Sam's Town and The Boulder Station) for only $894,000, or $5,600 per acre to purportedly build a golf course that he promised would offer a discount to locals and cater to nearby casinos. The same land was assessed by the Clark County Assessor at $40,000 per acre! The course was soon built, but no discount was offered, and the greens reportedly fell into a state of disrepair. Also, following the transfer, one of the then-city council members, the official who spearheaded the bargain basement sale, coincidentally began a meteoric rise to wealth. Five years later, Walters was back before the city council, this time headed by his former lawyer-turned-Mayor Oscar Goodman, asking that the deed restriction that limited the 160 acres to golf course use only, be lifted so he can build over one thousand cracker box houses and make an estimated $50 to $60 million dollar windfall on once-taxpayer owned land. The mayor, like a Genie in a Bottle, seemed poised to grant his former client his wish, that's until the Las Vegas Review-Journal began criticizing the latest sweetheart deal. This is not the first time Walters has come before Goodman's council asking for favors. On April 19, 2000, during an unimportant matter that attracted no attention, according to the LV SUN, "... the council was deciding whether to allow Walters' company sell its interest in the billboards at the Desert Pines Golf Course, which Walters leases from the city. Before a vote on the matter, Goodman asked (City Attorney Brad) Jerbic if there was a problem if he participated. According to a transcript of the meeting received from the city clerk's office, Jerbic said the city's ethics board has reviewed similar situations and 'where there's been a professional relationship that terminated over two years ago, they have found no conflict exist. And that being the case here, no conflict exists with respect with you and Mr. Walters.'" Then, in October, 2001, Walters made a bid on a management contract for another city owned golf course. Though the committee that recommends such things voted against him in favor of someone offering less financial risk to the city, Goodman said, "If I have a choice, if you know somebody and they're honorable, and you've done business with them in the past, they get the best of it," and promptly, without disclosing his ties to Walters, voted to grant him the lucrative contract. With this information in mind, and since I was the author of the City of Las Vegas Ethics in Government Law that says a public official must publicly disclose any potential conflicts of interest before discussing or voting on an item that could enrichen someone they've "done business with... in the past," I red flagged every time Walters received a favor from Goodman. In the most recent event where Walters stands to make an obscene profit on what was only five years ago a piece of taxpayer-owned land, I couldn't contain myself and, with the assistance of a learned colleague, filed the Ethics Complaint. After our complaint was reported in newspapers across the state, Walters was interviewed by Dan Kulin of the Las Vegas SUN. Walters revealed that he put his home up for collateral to cover Goodman's legal fee, a fee that was obviously sizable enough to warrant public disclosure. The following day, Ed Vogel of the Review-Journal Capitol Bureau reported that Goodman stated on the record at a council meeting in 1999, that his business relationship with Walters terminated only "several years ago." That's several years prior to him beginning to grant Walters favors at council meetings. He also never mentioned what he was paid for his services, though in the 1980s, Goodman was well known for requiring a half-million dollar retainer from his criminal defense clients. If Billy Walters wants the mayor and council to lift a deed restriction so he can enjoy a $50 million dollar profit from land he picked up from the taxpayers for a song, the mayor should be disclosing that a lucrative relationship between himself and Walters once existed -- no matter how many years before he was elected -- each time Walters comes before the council for favors. A quick, "That relationship terminated, oh I'd say several years ago," along with a wink from the obedient city attorney, does not suffice when the public has the right to know when possible political paybacks are taking place. Futhermore, the city attorney's patronizing opinion was not accepted by the ethics commission as an excuse for his boss's lack of ethics in the 2004 case when Goodman was found guilty of violations of state law. He had sought the opinion of Jerbic then, and it was found to be just as unreliable as it is in this case. And though the ethics commission may, or may not, decide to proceed with our complaint, the previously secret information is now where it belongs, in the public domain -- the court of public opinion, and that was our primary goal in taking this action.